WISCON HAS ARRIVED! Party time approacheth! 2) There's no vid discussion panel on the proper schedule, but there will be a Vid Discussion Impromptu Panel at 10:30 am on Sunday in the impromptu programming room. What could be better than talking about the awesome vids you will see at the party? Don't miss it! Tell your friends! Watch vids, ooh, ahh, sing, discuss, it'll be great. If you are willing to help make subtitles, please reply here with a good email to contact you (comments are screened) and I will send you a playlist to subtitle! Try subtitling one vid a day and we'll be all set for the party next Saturday. We would prefer folks to sign on for a full playlist (4-7 vids), but if you can only take on 1,2 or 3, we'd still appreciate the help. Reminder: seeking Premieres, vidding mentors, and new vidders! Hey there vidders and fans! How's your vidding going? Are you excited for this year's Vid Party? We are too! This weekend marks 4 weeks until the deadline for Premieres. If you need some help reaching the finish line, last month's Vidding Workshop has plenty of tips and resources. A big thank you to everyone who participated in making the workshop a success. And, if you'd like more one-on-one help, we are continuing our mentorship program, as well. Just keep clipping! Just keep clipping! Premieres: We are looking for your new vids to premiere at the con! We welcome all fanvids in all genres and from all traditions of fannish video production, and welcome vids from new vidders. The premiere deadline is May 9. See here for all information about submitting a premiere vid. Mentoring: Want to learn to vid? Want to help someone learn to vid? Sign up for our Vidding Mentorship program! We match up new vidders with experienced vidders as mentors, to cheerlead, answer questions and/or beta. Both new or potential vidders who'd like a buddy, and experienced vidders willing to mentor,sign up here! You do NOT have to be attending Wiscon to submit premieres or playlists, or to participate in the mentorship program. If you're interested, we'd love to have you! On Tumblr? Reblog our post there and help spread the word! Announcing the March 2014 Vidding Workshop! & Vidding Mentoring! From vids that critique sources from feminist angles, to vids that focus on feminist, underrepresented and/or diverse media and characters, to vids that celebrate female-centric fandoms and diverse communities, there are a lot of connections between vidding and feminism. In that spirit, we want to help build interest in and capacity for vidding in conjunction with vid programming at Wiscon and the Wiscon Vid Party. To help do this, we are announcing: (1) a vidding workshop, to be run the weekend of March 1-2, 2014 on wiscon_vidparty; and (2) vidding mentorships! You do NOT have to be attending Wiscon or planning to participate in the vid party to participate in either the workshop or mentoring. We want them to be general resources, open to all interested vidders of all experience and skill levels. Read on for more info and to participate! As we put the workshop together, we need vidders to participate! All you need to do is be willing to write a “vidder intro” post of whatever length/detail you want talking about vidding, your vids, how you got into vidding, and a short overview of your vidding process, and be able to be around a bit to answer questions at your convenience the weekend of March 1-2 (or in the days following). 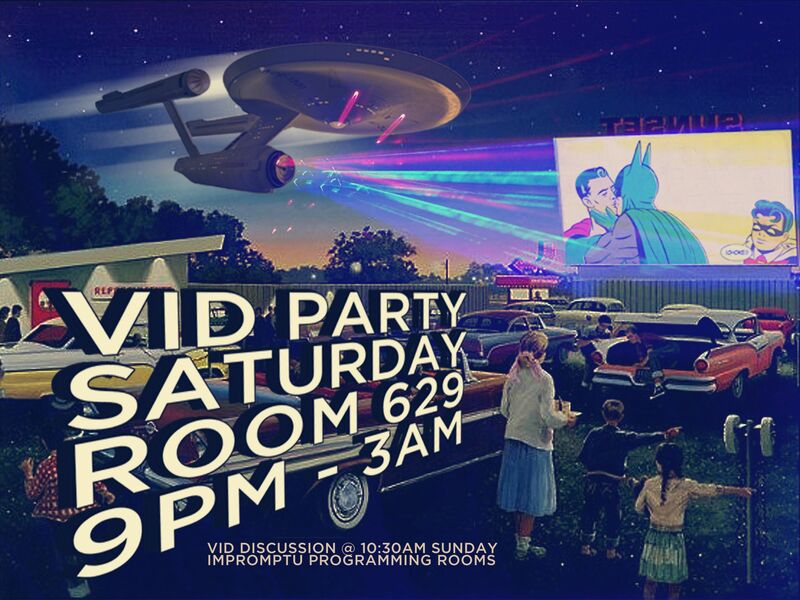 Vidders, please sign up by commenting (comments are screened) or emailing vidparty.wiscon at gmail.com. Please include contact info! New/potential vidders: Sign up for a mentor if you want one by commenting or emailing, and please be thinking about topics or questions for the upcoming vidding workshop in March! Want to participate further in the 2014 Wiscon Vid Party? You can submit premieres or submit a short themed playlist (i.e. a short vid show) to play at the party! See those links for more info. Comment below or email vidparty.wiscon at gmail.com and me or metatxt will answer any questions you have. Call for premieres for Wiscon 38! Once again, we are also soliciting premiere vids to play at the Wiscon vid party! The vids will premiere at the party on May 23, 2014. We’ve had lots of excellent premieres in the past years, and we are excited to keep building a tradition of vids at Wiscon. We welcome all fanvids in all genres and from all traditions of fannish video production, so long as they have some connection to Wiscon's focus on feminism and science fiction. WisCon defines feminism broadly, and we're interested in vids that engage with any aspect of gender, sexuality, race, disability, and/or class. We don’t want definitions to limit you; if you’re interested in Wiscon’s themes and consider your vid to engage with these ideas, we’d love to have it at Wiscon. If you are looking for inspiration, here are last year’s premieres from Wiscon 37, and this playlist includes the premieres from Wiscon 36! • If you're submitting a premiere, your vid must never have been shown at a convention or posted online before. • We prefer that your vid is no longer than 5 minutes. • We welcome vids from fans who may never have submitted a vid to a convention before, or from newbie vidders. • You don't have to be attending Wiscon to submit a premiering vid! If you're planning to submit a premiere vid, we'd love for you to let us know so we can begin to get a sense of how long our Premieres show will be. The deadline is Friday, May 9, 2014, two weeks before the con. If you need flexibility with this deadline, please contact us and we can discuss. Please follow wiscon_vidparty or wiscon/ wiscon if you want to see more info, reminders, etc. If you aren't able to make a premiere but want to participate in the vid party, you can also submit a short themed playlist (i.e. a short vid show) to play at the party. Or do both! We are planning an online vidding workshop in early March 2014 to connect vidders with newbie vidders or potential vidders with questions about any aspect of vidding, including matching interested newer vidders with more experienced mentors(/cheerleaders). Watch wiscon_vidparty for more information! Call for curators for WisCon 38 Vid Party! It’s time to start thinking about this year’s vid party, yay! metatxt and myself, chaila, are organizing this year’s party, with lots of help from other folks. Here’s a list of playlists from previous years if you want to get an idea of how this has worked in the past (last year was the first year we broke the party down into smaller blocks like this). We would like to gather playlists as soon as possible. Please get them to us by Friday May 9 at the latest! Email your playlist info to vidparty.wiscon at gmail.com. ETA 3/8/14: Formal signups for curating are closed because we're full up. But things tend to change as the con gets closer--people get busy, things come up--so email us at vidparty.wiscon@gmail.com if you want us to contact you as a backup if space in the show opens up! chaila - WISCON HAS ARRIVED! Party time approacheth! metatxt - Reminder: seeking Premieres, vidding mentors, and new vidders! chaila - Announcing the March 2014 Vidding Workshop! & Vidding Mentoring! chaila - Call for premieres for Wiscon 38! chaila - Call for curators for WisCon 38 Vid Party!